Dr. Denka was born and raised in Dayton, Ohio. He graduated from Fairmont West High School. After obtaining an undergraduate degree in Biology from Denison University in Granville, Ohio, he attended medical school at the Chicago College of Osteopathic Medicine, graduating in 1985. He completed a rotating internship and Family Medicine residency at Grandview Hospital and Medical Center and joined Dayton Family Practice in 1987. Dr. Denka is an active member of the American Osteopathic Association, the Ohio Osteopathic Association, the American College of Osteopathic Family Physicians, the American Academy of Family Physicians, and the Dayton District Academy of Osteopathic Medicine. He is Board Certified in Family Practice and is on the medical staff of Grandview and Southview Hospitals, as well as Kettering Medical Center and Miami Valley Hospital. He has served as Chairman of the Department of Family Practice at Grandview Hospital and Medical Center, as well as various hospital committees including the Staff Executive Committee. Dr. Denka currently serves on the Board of Health for the City of Oakwood and has served on the Alumni Board of Governors for the Chicago College of Osteopathic Medicine. He is an Associate Clinical Professor of Family Medicine at Ohio University College of Osteopathic Medicine and is involved in training medical students. He is married to Pam Denka and has three grown children. Dr. Kallet is originally from Rochester, New York, where she graduated from Penfield High School. She received a Bachelor of Science in Biology from Niagara University in Niagara Falls, New York. She attended medical school at Kansas City University of Medicine and Biosciences, from where she graduated in 1992. She completed a rotating internship and Family Medicine residency at Grandview Hospital and Medical Center in 1995, at which time she joined Dayton Family Practice. Dr. Kallet is board certified in Family Practice. 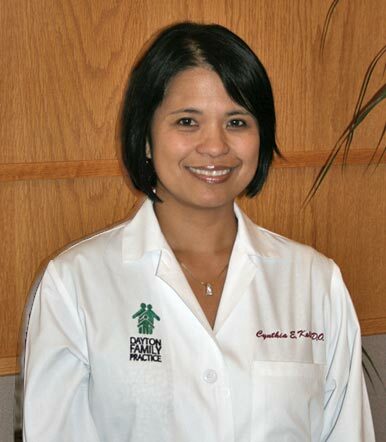 She is on staff at both Grandview and Southview Hospitals, Kettering Medical Center, and Miami Valley Hospital. She is an active member of the American Osteopathic Association, the American College of Osteopathic Family Physicians, and the Dayton District Academy of Osteopathic Medicine. Dr. Kallet is an Associate Clinical Professor of Family Medicine at the Ohio University College of Osteopathic Medicine. She is married to Oscar Kallet and has two children. 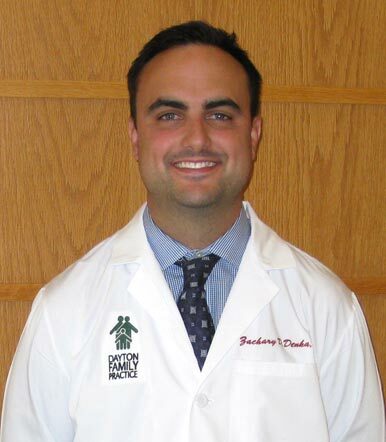 Dr. Zachary Denka, the son of Dr. David Denka and the grandson for Dr. George Denka, was born and raised in Dayton, Ohio and is a graduate of Oakwood High School. He completed his undergraduate degree in Biology from Miami University in Oxford, Ohio. He attended medical school at University of Cincinnati where he was awarded the Thomas D. Hunnicutt award by the Family Medicine Department. He completed his residency in Family Medicine at the Christ Hospital, University of Cincinnati Family Medicine Program and graduated in 2016. During residency he was involved in International Medicine, leading a trip of physicians and medical students to Guatemala. He was also active in delivering care to the underserved in Cincinnati. He has been practicing at Dayton Family Practice since his graduation in 2016. Dr. Denka is a member of the American Academy of Family Physicians, the Ohio Academy of Family Physicians, and is on the medical staff of Kettering Medical Center and Miami Valley Hospital. He lives in Dayton, Ohio with his wife. 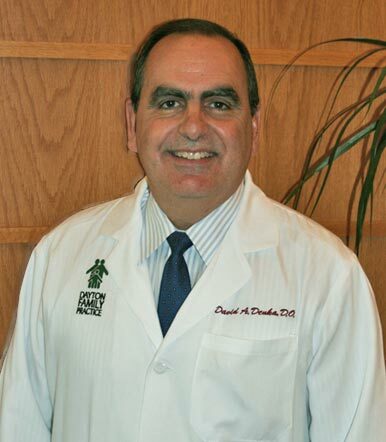 Dr. Denka maintains an interest in the education of medical students and residents, as well as academic medicine. He has multiple publications and is actively involved in the Racetrack Clinic at River Downs in Cincinnati, Ohio, which delivers care to migrant workers. His passionate about providing care to the Dayton region, and carrying on the legacy of his Grandfather, who started Dayton Family Practice in 1959.